As a tarot card reader, part of your job is to read a person’s cards in a manner that inspires trust and satisfaction in your client. You must read your client’s combination of cards in a fashion that is true to the cards but realistic and positive at the same time. With that in mind, there is no card that inspires more dread and misunderstanding in clients than Death. For people that are unfamiliar with Death, they will naturally assume the worst when they draw this card. After all, the grim, skeletal figure of this card naturally conjures up thoughts of death, suffering and our own mortality. Many clients will assume that either they, or someone they know is about to meet their maker, if they draw this ominous card! In fact, the card Death has absolutely nothing to do with actual death. But it is your job to allay in your client their natural fears, and point out the true meaning of the card. Actually, interpreting the card Death and explaining its true relevance to a client, is something that I regard as a rite of passage for all new tarot card readers. 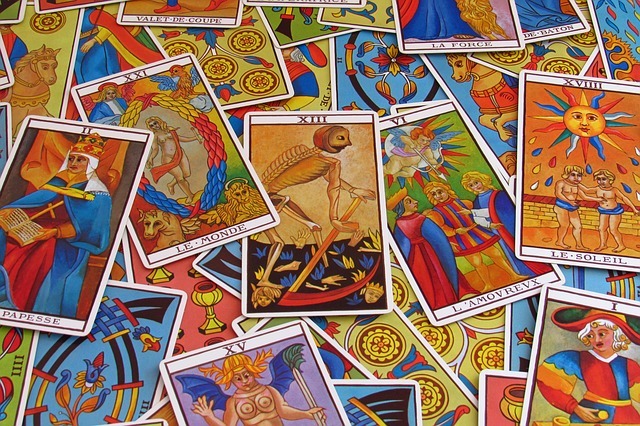 It tests your ability to calmly connect with your client, meaningfully “unpack” the true meaning of the cards and inspire in them trust and understanding. If you cannot do this with success, then you might need to practice more before you take you divining skills to the world! What does Death stand for? As I said, the first thing you need to explain to your client is that drawing the card death should not be taken literally. It does not stand for physical death at all, despite its frightening natural implications. It is, however, a very powerful card with serious connotations. The best way to introduce the card Death is to ask your client “What does death stand for?” The first thing your client is likely to say is actual physical death, dying and absence. After they have made the obvious literal connections, ask them to offer non-literal meanings. No doubt they will start to think more creatively by giving more abstract meanings, like “the end of something”, “the finishing of a journey”, “ending one chapter of your life, and embarking on another”. Indeed these secondary understanding of the card Death are more accurate. After all, Death is merely a symbolic card that represents the end of one thing, and the beginning of something new and unknown. So, in a sense, Death certainly does imply that something in your client’s life is dying or coming to an end, but with that death there will come rebirth and new life. The card Death is a very important card because it foreshadows that your client is about to experience a significant change in their life. It is a card the signals the end of one stage in your client’s life, and the beginning of an entirely new phase. This process of ending and beginning should not be a frightening thing at all, but rather an opportunity for your client to overhaul their life. Like when we experience a death in real life, your client should expect to feel a mixture of emotions when they end this era. Like when we say goodbye to a loved one, your client may not want to let go of the phase that is ending. They may feel unprepared, sad and want to cling to a particular situation despite the fact that it is naturally dying. Explain to you client that when the experience the end of this era, they may feel all the emotions that accompany grief, like disbelief, anger and finally acceptance. This is all normal, and is part of the process. Encourage your client to reflect on their past, understanding that each phase in our life has a “mortality” of its own. As with our physical existences, we cannot always control our destiny. Drawing the card Death means you client should be ready for major change, but it is your job as their reader to encourage them to embrace change philosophically, as we accept physical death philosophically. Explaining the card Death to a client is a challenge but it is an important step in becoming a competent, inspiring reader. As a general point to people who want to start reading cards, there is no greater piece of advice than to first teach yourself how to be an effective communicator. The card Death shows us that no matter how intuitive we are, no reader is worth their salt if they cannot communicate effectively. After all, your clients are relying on you and expect a faithful but positive explanation of their cards. You need to allay their fears when they draw Death, reminding them it is only symbolic not literal. Learn how you can make your Dreams, Wishes & Prayers all come true. This amazing Rare Book has changed thousands of lives for those people who are lucky to gain access to it.